Last week I met a fellow celiac who asked me what foods I missed the most since going on the gluten-free diet more than five years ago. I had to admit that there’s no one specific thing that I crave. As far as I’m concerned, the major food groups are comprised of chocolate, cheese, fresh fruit, and wine, and being diagnosed with celiac disease hasn’t stopped me from enjoying them (though it has limited my selection of chocolate, since some brands — such as Lindt — are made with malt). I’ve found gluten-free pizza, pasta, croissants, and even butter tarts. But there is one thing I miss, and that’s convenience. Most people take for granted that if they’re out for hours — or stranded at an airport — they can find a quick meal somewhere. The gluten-intolerant don’t always have that luxury. Last week, when a business lunch in Toronto was cancelled at the last minute, I decided to explore the options. 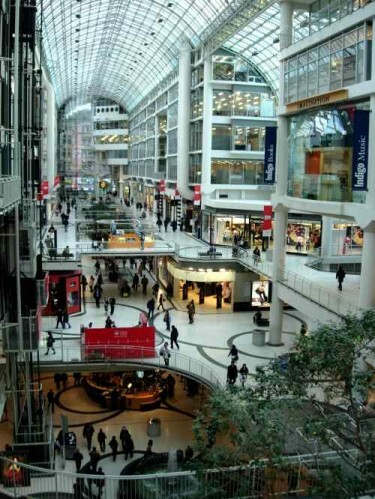 Since I was close to the Eaton Centre, Toronto’s famous shopping complex, I headed there. The news was better than I expected, and I found a few spots that could work for people with celiac disease as well as those with food allergies. Freshii: The beauty of the construct-your-own-meal concept is that it’s usually easier to avoid the trouble spots. Freshii offers salads as well as rice bowls (made with brown rice) and rice-noodle bases, to which you can add fresh, unseasoned ingredients. New York Fries: This Canadian chain serves up fries and only fries, so there’s no chance of cross-contamination in their fryers (an issue that can be a problem at some of the most famous fast-food chains). The fries are cooked in trans-fat-free sunflower oil. One catch: while the fries are gluten-free, some of the seasonings and sauces are not. Chipotle Mexican Grill: Well-known in the U.S. for its gluten-free options, Chipotle is a relatively new player on the Toronto fast-food scene. There are several options for celiacs, and the chain is allergy-aware, too. Take a look at the company’s allergen information, a chart that shows which ingredients contain wheat, milk, eggs, fish, shellfish, peanuts, tree nuts, and soy, as well as gluten. Chipotle is located across the street from the Eaton Centre in Toronto Life Square ([address] 323 Yonge St., Toronto [tel] 416-596-8600). Thank you SO much for sharing this, I work around the corner from there so this is great! I, too, am a celiac and given that I’m always hungery, I often struggle to find something quick and more importantly, filling, when I’m on the go. Sorry, but salad doesn’t cut it in that regard. I must admit, my go-to fast food meal is a Mc D’s grilled chicken sandwich with no bun. I get the chicken breast, lettuce, tomato and a packet or two of McChicken sauce ( i dont like the garlic mayo that comes on the chicken) and fries. According to my research, these items are gluten free and delish. I live beside a Mc Ds and they know what I want when I go for a quick lunch on the way home from class. Can’t say I’m particularly proud that they know me by name, but atleast I’m spreading the word about CD! Salads are my standby. McDonalds has some that are GF. Subway makes salads instead of subs if you want. Wendy’s side salad, chili or nachos are ok. You just have to read the dressing label. The best meal I ever ate was GF and in Toronto: at Lemon Grass. I always ask if something is GF and praise them to the hilt if it is. There are a lot of us out there now and getting the restaurant business aware of us helps others in the future. I visit TO regularly so these Eatons Centre ideas are a great help. If I know I am passing through an airport I check online to see what is available and check the restaurant websites and/or email them. I get great response. For all your Calgary readers, Thai Express at Market Mall. Pad Thai is made with rice noodles and GF. I found this place over the weekend, it’s in Guelph, but they have great frozen meals, and fresh backed goods – yes, the bread is not frozen! I am not sure if all Druxy’s locations do this, but one location close to my office does keep gluten-free bread stocked in their freezer. You just have to ask at the counter and they will get it out of the back for you. It’s in the underground concourse of Commerce Court (Bay and King), just a few stores down from Four/ Petit Four restaurant (which coincidentally also has some wheat-free options on their menu). The sandwiches at Druxy’s are outstanding and I eat there 2 or 3 times a week. In response to the above comment about about Thai Express, there is one in the Eaton Centre now. It is my go-to fast food place when I’m in there. Their Pad Thai is delicious. I would love to see more posts suggesting places to eat on the run. I’ve recently switched to a gluten free diet and its been very difficult with school. Even the salad I tried today upset my stomach! I would like to recommend one ‘fast food’ place though. I was at Mapleview mall recently, and I guess its very new. Its an Indian place called “Tandori” and I hope they start opening up more locations in the area. The first thing my mother and I asked was if anything included gluten. The employee knew the answer right away, it was wonderful. We’ve noticed most places just give you a blank stare. But he knew what he was talking about, he said none of the curries have gluten in them, and the rice is safe, the only thing to be worried about is the naan. And without us saying anything, he said he would put it on a separate plate to keep it away from the rest of our food (we shared a larger dish). It was wonderful! The food was delicious, and it didn’t feel like eating fast food at all. Plus, the confidence of the employees was very reassuring. Don’t order McD’s fries so quickly, I was told they have a flour coating on them. In fact if you order fries that were once frozen, there is a good chance they have been given the same treatment. Apparently the flour keeps them from sticking together. I generally do Wendy’s or Chipotle when I have to grab fast food. Wendy’s offers chili, salads, potatoes, and frosties for the gluten free diet. I am not celiac or otherwise unable to eat gluten, however my mother requires a GF diet and so I have some understanding if the dietary issues. She also has to strictly limit the amount of fat she ingests with each meal (part of the digestive situation) and so fries are never an option. My mother’s “safe” fast food of choice is Swiss Chalet. She orders a quarter chicken with baked potato and salad. With the skin taken off it is both a low fat and GF meal. One of the great things about this option is that Swiss Chalet’s dipping sauce for the chicken (and fries, if you can eat them) is entirely GF and also very low in fat… a bit of a treat for anyone who has to avoid gravy lest it be thickened with wheat flour. I’m not sure if Swiss Chalet has outlets outside Canada. Where did you find gluten free croissants? That seems to be the only thing I haven’t been able to find in Toronto.